The porous polymeric surface is suitable for a wide variety of activities and provides high-quality play combined with comfort, good grip, minimum risk of injuries and fast drainage after rain. Your Sport-Top MUGA will be ready for use even after rain. As an attractive alternative to natural grass our artificial turf cannot be beaten. 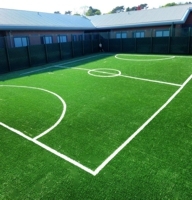 Our artificial grass is great for a MUGA (multi-use games area) too. Our artifical grass is ideal for a Sport England MUGA. A type 5 specification MUGA is also known as an Artificial or Synthetic Turf Pitch (ATP or STP for short) used in conjunction with a shockpad. A MUGA can be used for combinations of sports such as hockey, five-a-side football, football, and training areas. New range of artificial grass launched. The range includes 3G and sand-filled types providing excellent surfaces for football, rugby and multi-sport pitches. The range of synthetic grasses comes with lighting, fencing and equipment options. SportTop hits Dulwich! A SportTop pitch has been installed at Alleyns School in Dulwich, London. The 700sqm court was completed in May this year and is providing an outdoor netball facility for the school. The durable MUGA surface has been installed to meet the demands of both inter house and inter school matches.